I am very happy to inform everyone that Peace Poems is available for sales. I have a box sitting right under my chair yet to be opened of the work of art. First of all we’d like to thank everybody who has submitted poetry to our effort. The editorial staff is certainly excited about what he have received. 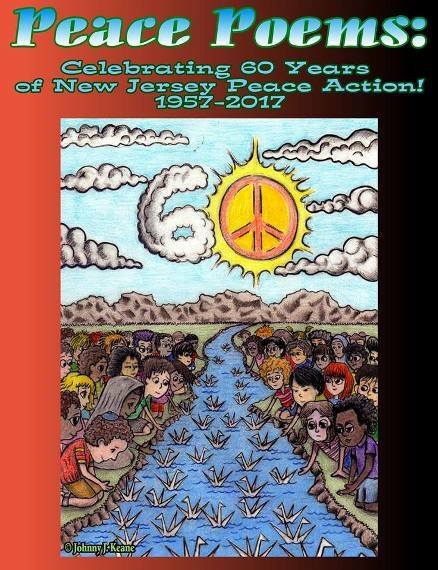 The Peace Action poetry magazine “Peace Poems” celebrating New Jersey Peace Action’s 60th anniversary is completed. I’d like to thank all of the artists for their contributions to this good cause. I am very happy to be able to present the cover for the magazine. I feel that we have a very strong and inspirational piece of art. We have hopes of conducting another project sometime in the future, perhaps one incorporating art and being more extensive in size and topics. But that is for another day. I will present the link for ordering “Peace Poems” in the near future. I would love to give all the artists a free copy but our very limited budget won’t allow that. However I will investigate trying to get all contributors a copy at a discounted price if possible.